God chose Saint Pio of Pietrelcina to reveal the supernatural life to our tepid era. His supernatural interior life was made visible through his immense suffering and his well-known stigmata. VIDEO: Discover how Padre Pio’s stigmata was different from the stigmata of Saint Francis of Assisi (hint: Francis’ had “nails” in them : click here to learn more about this mystery. As we move into November and pray for the Poor Souls in Purgatory, we do well to recall a few encounters of Padre Pio with the souls of Purgatory. Padre Pio once described an encounter he had with testified the following to the Bishop of Melfi, His Excellency Alberto Costa and also the superior of the friary, Padre Lorenzo of San Marco. A few days later, Padre Pio also told the story to Padre Paolino, and the two decided to go to the town hall, where they looked at the vital statistics for the year I908 and found that on September 18 of that year, one Pietro Di Mauro had in fact died of burns and asphyxiation in Room Number 4 at the friary, then used as a home for the homeless. Without a doubt, many souls from Purgatory visited Padre Pio seeking his prayers, sacrifices and sufferings to obtain their release. Pray for the Poor Souls daily. Make it easier to receive daily Catholic posts from Dr. Taylor Marshall. It’s free. Please click here to sign up by Email and get a free book, too. Please also explore Taylor’s books about Catholicism at amazon.com. Death rather than sin ! ​God over sin and eternal joy over eternal damnation. Choose life! Choose to be a saint. 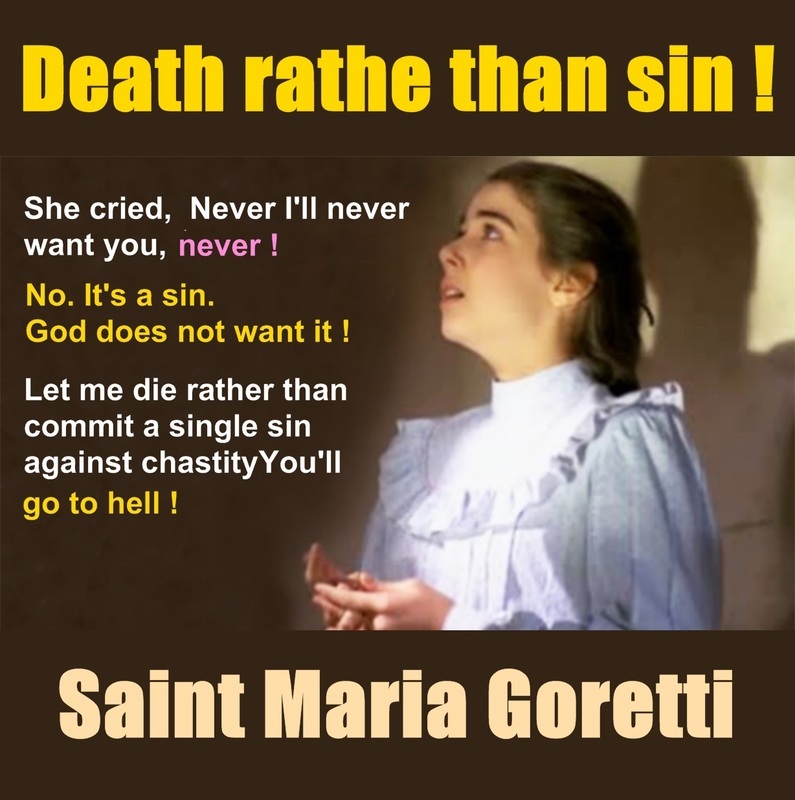 St. Maria Goretti is helping teenagers to preserve purity in the midst of daily temptations against that priceless virtue so neglected today throughout the world. Oh Saint Maria Goretti who, strengthened by God's grace, did not hesitate even at the age of twelve to shed your blood and sacrifice life itself to defend your virginal purity. h Saint Maria Goretti who, strengthened by God's grace, did not hesitate even at the age of twelve to shed your blood and sacrifice life itself to defend your virginal purity.